Black Marlin ship photos courtesy of Dockwise Shipping B.V., The Netherlands. Click here to see the background photo, taken at night showing the launch. A panoramic view of the LeTourneau Marine Groups facility on the banks of the Mississippi River, south of Vicksburg, Mississippi. On the banks of the Mississippi River, just south of Vicksburg, Mississippi, is a sight one would not expect to see in a locale such as this. In an area that is prone to flooding—an agricultural zone at the south end of the Delta—sits a marine construction facility that builds and launches gargantuan offshore oil rigs. 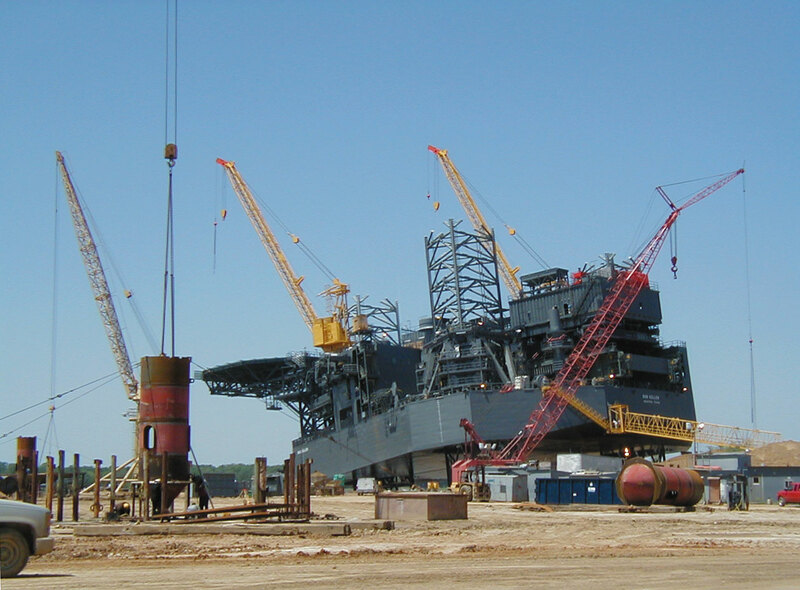 This facility, the LeTourneau Marine Group, is the largest builder of jack-up (or self-elevating) oil rigs in the world. The workers, a multi-national lot, were in the process of moving the Bob Keller, the second in the Tarzan class of jack-up rigs currently being built there, to the river’s edge during my visit last May . Walking the rig into the river (left) is a very slow, around-the-clock process, moving about 1-1/2 to 2 feet per hour in a rocking/sliding motion. Six bulldozers push dirt into a mound behind the hull of the Bob Keller and the sequence slides the huge rig slowly toward the river. The legs cycle at 1-1/2 feet a minute, and travel up and down about 35 to 40 feet per cycle. The two orange cylinders in the foreground are the cores of two of the feet of the third Tarzan class rig being built on the banks of the river. The Tarzan class rigs are smaller and less expensive than the company’s much larger Gorilla class which were intended primarily for the harsh environments of the North Sea and Eastern Canada offshore oil fields. Designed to be more competitive in the new deep-gas Gulf of Mexico market, the Tarzans are equipped to drill to subsurface depths below 25,000 feet, and to operate in water depths of up to 300 feet. Jack-up rigs sit directly on the ocean floor. The legs on the Tarzan class are 360 feet long. They keep the drilling platform above the wave action and provide a very stable drilling platform. 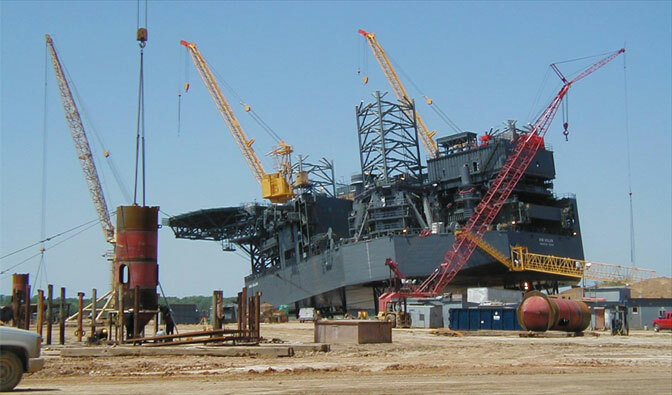 The body of the rig is constructed much in the same manner as a ship’s hull, resulting in a structure that floats when the legs are jacked all of the way up above the platform. 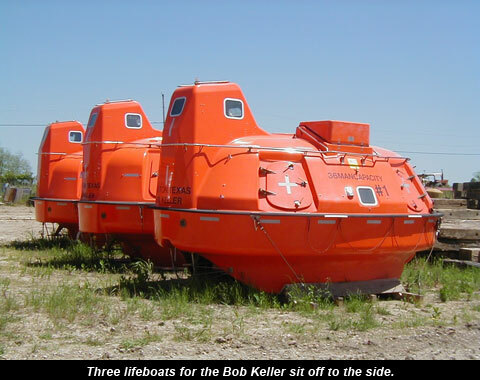 Launched into the Mississippi River, the Bob Keller will be towed to the Gulf of Mexico, then westward along the Intercoastal Waterway to the Rowan facility at Sabine Pass in Texas for final outfitting, part of which involves attaching the rest of the three long legs. If the rig were towed downriver with the legs complete, it wouldn’t be able to pass under the many bridges enroute, as the craft is towed with the feet flush with the bottom of the hull and the upper portions of the legs extending high above the upper deck. The legs are built in sections at the Vicksburg location and shipped by flat barge ahead of the rig. Once readied at Sabine Pass, the Bob Keller will be moved by ocean-going tugs to its deep-water destination where the legs will be extended downward and the hull jacked-up above the waves. For delivery overseas, these rigs can be loaded onto a heavy transport ship, such as the Norwegian-built Blue Marlin, the same ship that brought the damaged Navy destroyer USS Cole back from Yemen in October of 2000 to Ingalls Shipyard in Pascagoula, Mississippi. 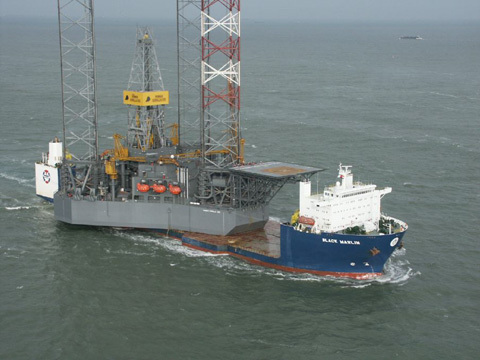 Sailing high and dry on its way to the North Sea, the Rowan Gorilla VII is shown at left being carried aboard the heavy transport Black Marlin, the sister ship of the Blue Marlin. Three more Tarzan class rigs are in the plans—depending on the vagaries of the market. At this writing [May 2005], a third rig is currently under construction. The three massive feet are taking shape literally on the grounds of the facility (see the launching photo at the top of this page) just south of the present location of the Bob Keller. The feet form a rough triangle, surrounded by large cranes and assorted equipment. In the center of this area, the hull of this rig is being formed while component fabrication is carried out on-site (right). Laid out flat on the earth, the emerging shape is supported by bleacher-shaped jigs that guide the workers as they build the beginnings of the next massive structure that will one day be inching its way towards the swirling waters of the Mississippi and then downstream to the Gulf and points beyond—all in the neverending search of the oil and gas needed to keep our economy moving ever forward. Allied Forces purchased 70% of the earthmoving equipment that they used during World War II from R.G. LeTourneau, Inc.